The Fifth Flight are a group of young, up and coming musicians from the Austin, Texas area who, by coming together originally at a local music performance school decided to get together and play some music. There’s nothing unusual about that. It happens all the time across this great land of ours when a bunch of high school kids get together and decide to start a band and make some noise – hopefully, that noise sounds pretty good after a little practice and sweat. Their story isn’t much different from a lot of young bands starting out, except that this band has won a lot of accolades for themselves in the short time — a whopping three years — that they’ve been together. Since their beginning, they’ve played at the annual Austin Trail of Lights holiday festival in Zilker Park, The Gatsby, The Belmont, Teller’s, Scholz’s Garten, Mohawk, Stubb’s, Rockin’ Tomato, and Pioneer Farms, among other major venues in the Austin metro area. They’ve also been finalists in and won several music competitions in Texas – they were finalists in the Band Aid School of Rock’s Jam Fest; they were finalists in the Battle of the Bands at the 2017 Wildflower! 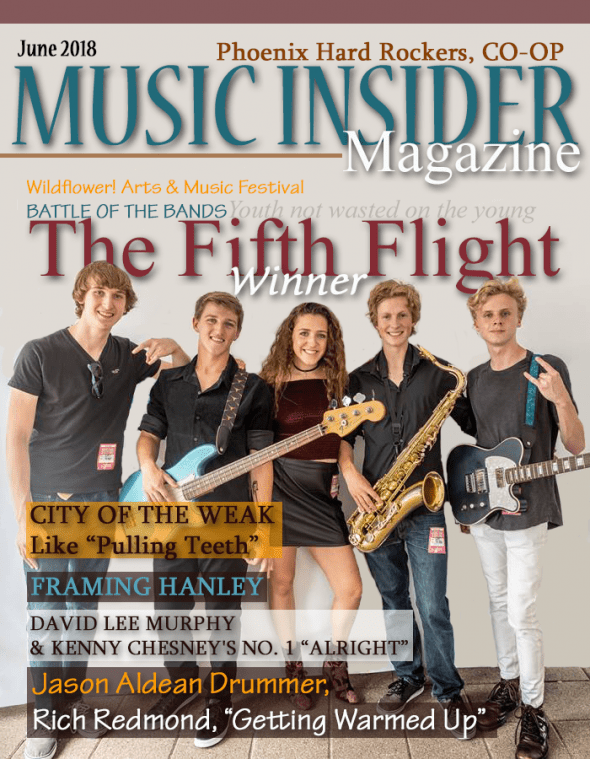 Arts & Music Festival in Richardson, Texas; and, this year they actually won it all at the 2018 Battle of the Bands at the Wildflower! A&M Festival. This year, they faced some stiff competition from some serious bands with some very good musicians who came there to compete — those other finalist bands being Cinema for the Blind and Coma Motel. Ultimately, it was The Fifth Flight who prevailed in this year’s competition. So, after all the excitement and hoopla died down from their most recent musical victory at the 2018 Wildflower! Arts & Music Festival’s Battle of the Bands, I got to sit down and have a little chat with the band (minus an absent bass player) to go over a little of the history of how they got together and got started playing shows around Austin, a little bit about what each of their backgrounds are in music, what drives each of them personally to write and perform original songs, where they’re potentially taking this project together, and what’s in store for their future. After getting to know each of them a bit better through this interview, I think you’ll come away from it as impressed as I was with each of their characters and intellects, as they shared their hopes and vision for their musical future. Brian McKinny: The band started three years ago in 2015 at James Mays’ Austin’s Band Aid School of Music. How did the band initially come together, and did you have anyone outside the band helping shape the band with the introduction of the members, or did the group come about more organically? Lee Trahan (guitar): That’s where we met each other, at the Band Aid School of Music, and after we’d been playing together in the school for a while, we kind of left the whole Band Aid thing — we worked with them still for a little while and ended up working with a new producer, and that’s how we all got here, and it’s what we’re still doing right now. McKinny: Tell me a little about this Band Aid School — is it on the same sort of model as the School of Rock? Yeah, it’s very similar to the School of Rock thing, where they get kids together to play for a while. If I remember correctly, it was at some camp we all did together where we all played together over one summer and ended up really liking playing with each other, so we kept playing through their model for a little while. McKinny: Originally, the band was called Tuesday Night – until 2017. What lead to the name change, and who proposed the name, The Fifth Flight? What does it signify/mean? Maggie Neuberger (singer): Well, Tuesday Night was a very kooky, confusing name, actually. We’d tell people, “Tuesday Night is playing Wednesday night…” It was just really confusing and became very difficult to work with, so we decided we needed a name change. We threw a bunch of different names we liked into some kind of a Google form and we argued about it for a couple of days until someone said, “That’s it, we’re doing this name,” and that’s how it kind of just happened. McKinny: Did you immediately start out writing your own songs and lyrics, or did you, like most new, young bands start out playing cover songs? Lee (guitar): When Tuesday Night originally formed, it was just me, Hunter (keys/sax), this singer named Caroline, and two other members – Dave was the drummer and Ken was the bass player — I can’t remember their last names. Caroline already had a bunch of lyrics and songs she had already written, so we started with the original stuff she had written, along with a couple of covers. But when we had our drummer, singer, and bass player leave and then got Jake, Maggie, and Josh to join up, we started with learning and playing some covers and eventually moved on to originals. McKinny: What kind of covers were you guys playing? Lee: The first cover we did was “The Ocean” by Led Zeppelin — most of the stuff we did was a combination of alternative and some heavy blues-oriented rock. Maggie: Yeah, we enjoyed doing Zeppelin, and we did Queens of the Stone Age’s “No One Knows,” too… Different things like that. McKinny: How long after you started playing together as a band did you feel you were ready to play out in front of a live audience, and where was your first live performance given? Lee: It was about a month after we started rehearsing that we did our first live show. We had all played in other bands before and had done a lot of this stuff, so it wasn’t very new to us, and once we learned how to play with each other and the songs, we could just go for it. Maggie: It was a Christmas show — Austin Trail of Lights, where the crowd sort of walks around in the park and it’s all lit up for the holidays. McKinny: How was the crowd? Were they receptive and supportive of your performance? Maggie: It was just a small crowd, mostly people who were walking by on the trail in the park where we were playing. The people who were there were supportive and enjoying themselves and the music and lights as they walked by. McKinny: This one’s for Maggie (singer): You’ve been taking vocal lessons and singing since you were 8 years old. You’ve won “Best Vocalist” prize at 2016’s Jam Fest when you were only 13, and you’ve been named the “Best Vocalist” at the 24th Annual Battle of the Bands. What drives you to sing, and when did you first know you wanted to be a singer? Maggie: My bio says I’ve been singing since I was 8 years old, but really I’ve been singing since I was much younger — ever since I can remember, actually. It’s just always been my thing I guess. I’ve always enjoyed singing, being on stage, and in the spotlight. We, me and my mom, came across Band Aid; we saw it as an opportunity for me to get out there and try something new, and I’m definitely loving it, and I’m kind of stuck with these guys now! McKinny: Lots of people take instrument lessons or singing lessons, but have you ever taken any lessons in live stage performance? Maggie: Very recently I went up to Nashville for a while and I met a guy whom I talked with him for a couple of hours about stage performance and presence, but for the most part, it’s been trial and error in figuring out what works for me. Also, I dance a lot. I’ve danced for 10 years competitively in Irish dancing. It’s a great sport, and I was always on stage with that, so that has helped me tremendously, especially with the physical part of performing. McKinny: What do you love the most about being a singer in a band, and if you could change one thing about it, what would that one thing be? Maggie: Oh gosh! I guess I love being able to call the shots a lot of the time, because I’m kind of up front and I suppose it’s up to me to lead the band on stage sometimes, so I guess that’s kind of great being able to push them around! (Laughing) As for something I’d change — something I don’t like, I really don’t know. I guess I don’t have an answer to that. I think that things are going pretty great, and I don’t have anything to complain about. McKinny: Do you see yourself doing this as a career, or do you have something else in mind for adulthood? Do you have plans to go to college to obtain a degree in music? Maggie: I would like to pursue music through my life, whether it is with this band or outside of that — I don’t entirely have any control over, but I do want to pursue music. I would like to go to college. I think that having a backup plan is important, and I would like to get a degree in music pathology or something like that. I don’t have a solid plan yet, but I do know that the first thing on my list is music. McKinny: Who are your influences as a singer and what is your favorite style of music to sing and perform live? Maggie: I have a lot of influences. I really like Nai Palm, the singer for the Australian band, Hiatus Kaiyote. I don’t necessarily think my style is like hers, but I think that she’s an amazing singer, and I definitely consider a lot of her vocal style and technique in my own singing. I love Ella Fitzgerald; I love Alicia Keys, Amy Winehouse, and Sabrina Claudio… There are so many artists that I take pieces of that I place into my own singing. And there are so many styles that I enjoy — I’ve performed soul, jazz, rock, blues, pop, classical — so many genres, and in each different genre there’s something that I love. When I perform rock, I get to go absolutely insane when I’m on stage. When I perform jazz it’s just a relaxing, peaceful, almost meditational experience. When I perform classical music, that’s probably my least favorite genre to perform, but I still find it important and I know that it’s helping me with my form, so really, it’s kind of hard for me to say that one is my favorite because each genre is my favorite in its own way. McKinny: Is there a main composer in your band, or is it a collaborative effort, with each member writing their own part and adding to the arrangement? Jake Rothfus (drums): It’s pretty much a collaborative effort, you know? Everyone works on their own part. Some people do more with chords; some people do more with lyrics. It’ll change depending on the song as well. Some songs one person won’t work on at all, while other times someone comes in and writes something that you never expected them to. McKinny: What about lyrics? Is there a main lyricist in the group, or do you all pitch in with ideas? Maggie: It’s mostly me. I usually write all the lyrics and the melody, and then they pitch in if they don’t like something, so I’d say I write 85 – 90% of the lyrics/melodies, and then down the road if someone thinks something needs to change, they pitch in and we change it. McKinny: Who has the final say on the songs – as far as the overall composition — music and lyrics together? Again, do you work it out as a group, or is there one or two of you who have that responsibility? Jake: Generally we agree as a group, but if someone thinks differently, they’ll raise their issue and then we’ll talk about it and decide. If it’s a majority of us that decides something needs changing, we’ll change it, but if it’s not, it usually stays. It’s a basic way we solve problems, but it works for us. McKinny: This one’s for Lee Trahan (Lead Guitar): You started playing piano when you were only 5 years old. What happened that made you decide to stop playing piano and pick up the guitar as the instrument you wanted to play? Lee: Well, the reason I started playing piano was that my parents told me that if I wanted to play guitar I had to learn to play the piano first. So it was more me saying, “I’ve done this, so now I want to move on to the fun part.” For me, that’s always been the guitar. McKinny: Watching your video on YouTube, I could tell just by watching you play and listening to your riffs that you are heavily influenced by Jimmy Page, Stevie Ray Vaughan, and even a bit of Eric Clapton. Who’s your absolute biggest influence on your style of playing, and what is it about that person’s playing that is so influential for you? Lee: If I had to pick just one, it’d have to be Stevie Ray Vaughan, just because his leads are so great, he doesn’t repeat things too often, and his rhythm playing is just on another level. It’s one of those things that people will overlook because he was such a great lead player. McKinny: What’s the difference for you between playing in your school’s Jazz band and playing in a rock band like The Fifth Flight? Lee: For jazz band, it’s kind of like being ruled by one person, which is the teacher/director. I’m not really too big on that, which is kind of why I only did it for one year. But in a rock band you bring to the table what you want to bring to the table. It’s not like you’re limited by what someone else does with you, which can stifle your creativity. McKinny: What are your plans for the future? Do you plan on a career in music, playing guitar? What about college? Are you interested in getting a degree in music performance/guitar, or do you have something else in mind? Lee: I think that music is definitely what I want to pursue as a career. Whether or not that will actually work out, I don’t know. But music is definitely what I want to pursue. I guess that a degree in business will be my fallback if music doesn’t work out, or get a degree in music business — maybe a double major in music and business. We’ll just have to wait and see. McKinny: These next questions are for Jake Rothfus (drummer): Were the drums your first instrument? Did you play anything before settling in on the drums? Jake: I played piano for a little bit, but that was more because my parents wanted me to. But after a while, I realized I really didn’t like playing the piano and my parents got tired of me banging on things around the house like a little cringy five year old. They were like, “Okay, we’re getting him a drum set so he’ll hopefully stop beating on things.” I was about 7 years old when I started playing, so I’ve been playing drums for about 10 years now. McKinny: What got you into learning about sound engineering and production? How do you plan to expand and incorporate those skills into your drumming both in the band and on your own? Jake: I started getting into electronic music — I really like EDM, and like a lot of people do, I thought, “Let me get some software and mess around with it for a while and see if I can do stuff like that. I wasn’t particularly good at it or anything, but I just really enjoyed it so I started getting professional software. I got hold of (Presonus’) Studio One — I have a piano that I hooked up to MIDI, and I started actually looking up videos on how to record instruments, how to work with samples, how to do all this cool stuff. I just really enjoyed it and I started making some of the music I’ve always wanted to make. McKinny: You were voted the “best drummer” at this year’s Wildflower! Arts & Music Festival. Congratulations! What can you tell us about your experiences at this year’s Wildflower! Festival? Jake: Thanks! Yeah, it was pretty cool. I really liked the other bands this year; it was really cool getting to hang out with them and talk about music. At the beginning of the festival, I didn’t think I was going to win “Best Drummer” — those other guys there were really good! One of them even sang and played drums; I didn’t think I could do much better than that. But, I just had a good time and went for it. It was awesome to get to play on a big stage again; the sound guys were great, too! They helped us with all the stuff, and the mix sounded great on stage. From the point of view of someone who works on mixes and stuff like that, I really appreciate it when they get that stuff right. It was a great time! McKinny: What about plans for after high school? Do you plan to continue your education with music/percussion degree, or perhaps pursue a degree in sound engineering? Jake: Yeah, so it looks like, as far as a backup plan, I do computer science, so I’ll likely be getting into that or some kind of computer engineering. Ideally, I’m applying to the Harvard/Berklee program up in Boston. That way I can do my music at Berklee while getting a really good computer science education at Harvard. It’s probably not going to happen, but I can dream! McKinny: This one’s for Hunter Nyhuis (Sax and Keyboards): You were born in Western Australia, living in Perth with your family before moving to Austin with your parents when you were only 11 years old. Before your family came to the US and settled in Austin you were playing guitar, but later switched to piano because you had received a 3-year piano scholarship. What precipitated the move, and how did you deal with the scholarship and moving to the US? Hunter Nyhuis: So my mum has family nearby to Austin in Antioch, and she has a share of a business working in Dallas, so Austin is in the middle between family and work, so Austin was overall, a nice location. I was 10 years old when I got the piano scholarship with a high school in the local area in Perth — I was still in what we call “Primary School,” which you call middle school here. And through this program you’re selected from a music class, so you’ve already demonstrated certain skills on tests. In the program there were three or four other pianists with me that were unique to the high school and we just received direct training from there. McKinny: Was this a music performance high school, or was it a stand-alone program at a regular high school where you were on scholarship? Hunter: It was a (stand-alone) music performance program that they had at a regular high school. It was something that, although not easy to get into because the scholarships are competitive, the training is done in a regular high school. Luckily, I was able to complete the first year of the three-year scholarship before we moved from Australia to the US. From there, I’ve not taken any lessons since leaving Australia. I’ve been completely self-taught since then. McKinny: Was it hard for you to give up guitar to play the piano, or was it something that you preferred to do, playing piano, keyboards, and sax? Hunter: I really enjoyed playing the guitar; I still do love the guitar. It was just more or less that the three year scholarship presented itself and I had to focus the majority of my time on piano. I’m also self-taught on the tenor saxophone, as well. McKinny: You’ve been invited to play with other professional bands, first for live gigs, and later for recording opportunities. How did those gigs go? Hunter: Yes, I played sax on three songs that were recorded. Well I’ve always loved improvising and I get some of my big influences from improvisation, and I love and will accept any opportunity to jam and improve with someone. So, through a previous music teacher/mentor of ours from the Band Aid program, Dalton Jackson — I was out with him one time watching him play when a friend of his invited me to play. And another band I got to play with through a family connection, we actually jammed — I had my sax one night at his house, which led to him inviting me to play with his band. That was really a lot of fun. McKinny: Sadly, your bass player, Josh was unable to make it to the interview today, so I’ll miss out on getting his input in this interview, and that’s unfortunate. Please offer our congratulations on the Battle of the Bands win for us. And with that, please tell us what the band has in store for the coming summer — what’s your next move, and what about recording? Are you planning on recording any new original songs or perhaps an EP/LP anytime soon? Jake: Our plan for what we’re going to be doing next is to start getting new songs recorded so we can start to expand our Internet fan base, to get more people to come to our shows, and overall be heard more. We’re working on a website as well, to try to improve our online presence as a whole. So that’s the next step. Also, we’re going to be doing some recording at the Band Aid School of Music. I think we’re going to try to record three or four songs in the next few weeks coming up, and we also will be using the professional recording studio time we won as part of the prize from winning the Battle of the Bands at Wildflower! to do even more recording when that presents itself. We still have to wait to get the particulars of when and where we’ll be recording songs with the studio time we won at the Wildflower! Festival this year. We’re really looking forward to working on all this new music and getting it out there to be heard! The Band: We’d also like to give a huge shout-out to our bass player, Josh Myers, for winning “Best Bass Player,” and to the Wildflower! Arts & Music Festival for allowing us the opportunity to play on the big stage, and to win the studio recording time as part of it all. We look forward to playing again next year at Wildflower!, and especially to watch all the new bands compete. We had such a great time this year, it was just awesome! Thanks so much. It couldn’t have been more fun!